In this book readers will learn all about how fireworks were invented in China over 2,000 years ago, how Queen Elizabeth I created a special honor for the person who created the best fireworks, and much more! A special section at the back of the book includes Common Core–vetted extras on subjects like social studies and math, and there’s even a fun quiz so readers can test themselves to see what they’ve learned! Learning history has never been so much fun! Kama Einhorn has authored more than forty children's books and written magazine articles and web content for Sesame Street, Nickelodeon, The New York Times Learning Network, and the Humane Society. She holds a master's degree in education from the University of California at Berkeley, and lives in Brooklyn, New York. Saturday morning cartoons and lounge music, big-time wrestling and creature movies, bowling alleys and flying saucers, kitschy fun parks and the Ramones, diners, Dino-Land, Dean Martin–these are just a few of Daniel Guidera’s favorite things that inspire his signature Illustration-A-Go-Go! style. His work has appeared in venues such as MAD Magazine, Topps baseball cards, cookie boxes, in-flight magazines, great metropolitan newspapers, technology magazines and grade school textbooks. Most recently, Daniel had immense fun creating illustrations for the iPad e-book app My Dad Drives A Roller Coaster Car, currently available in the iTunes store. He’s won awards, but then, so has everybody. 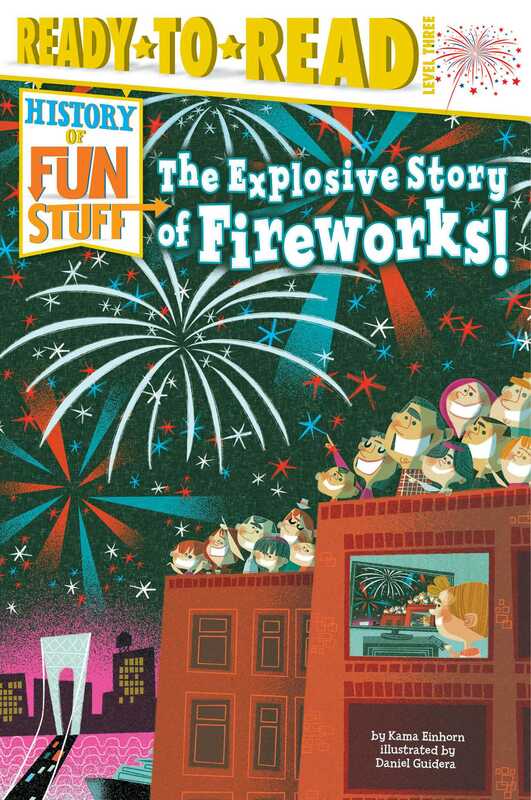 Book Cover Image (jpg): The Explosive Story of Fireworks!